We've uploaded some nice pictures of the ex-Louis Rosier Talbot-Lago T150C SS Competition Roadster into our Gallery. The first four images are sized 1600x1200 to grace your desktop. 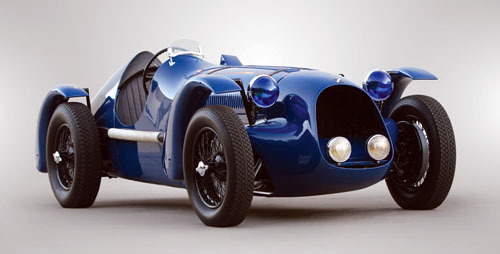 Chassis #90115 was initially commissioned by a Mr. M. Cattino of France with a metallic blue Convertible body and was delivered in 1938, shortly before the Nazi invasion of France. The second owner of this car was the famous racing driver Louis Rosier. It seems likely that Rosier purchased the car after the war as it was in 1946 that he began driving the car when motor racing resumed following the war. Still wearing its Figoni coachwork, Rosier simply removed the wings and windscreen and effected other small changes in order to make it more suitable for competition. Later, in 1947, Rosier had a new Grand Prix coachwork fabricated and installed, reportedly by the Talbot factory, but there are indications that the Figoni body may not have been removed and discarded, but rather re-skinned and rebuilt into its new form. This is the coachwork that remains with the car today. Read more about this car's history in the Gallery and download one of the first four images for your desktop. The images first open in 670 pixels wide. Click on the picture again to have it enlarged. Images courtesy of RM Auctions.